Claudio Arrau was one of the most distinguished and influential concert pianists of the twentieth century. His particular approach to the creation of sound was legendary. 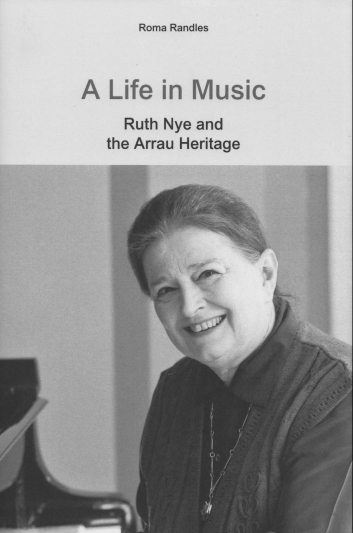 Concert pianist Ruth Nye studied with Arrau in New York and mantained a very active professional and personal relationship with the maestro until his death some 30 years later. Ruth Nye's performance career continued for many years until she developed Dupuytren's contracture of the fifth finger of her left hand, which left her unable to play professionally. Ruth Nye, MBE, FRCM, is now one of the most highly regarded piano teachers in the UK. This is the story of her life and her musical philosophy. Roma Randles holds a Bachelor of Music from the University of Melbourne, where she studied with the renowned Lindsay Biggins, and Postgraduate Diploma in Education. She has organised and promoted concerts in Australia and throughout Europe. As founder and director of Lingua Musica she has taken groups to all of the major musical centres of Europe. While resident in the UK Roma met and studied with Ruth Nye. Their relationship had a profound effect on her. This biography is a tribute to a great musician and a great friend. Published by Grosvenor House Publishing Ltd.